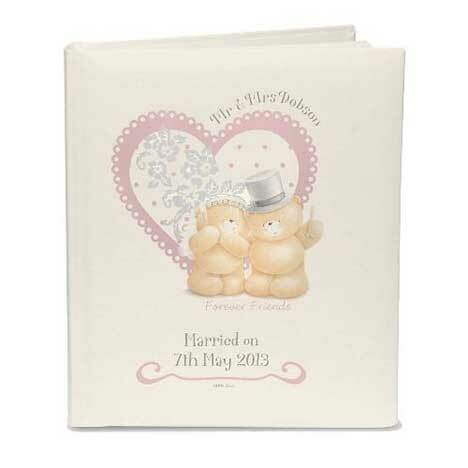 The front of this cream Wedding album is beautifully decorated with the loveable Forever Friends bears and vintage polka dot design. The album itself has approximately 30 tissue interleaf pages, perfect for placing all of those special memories from the big day and a leatherette exterior finish for the finest quality. This Forever Friends Traditional Cream Photograph Album can be personalised with any surname using up to 15 characters and any message spread over two lines using up to 25 characters per line.